A Real Estate Sales Representative Serving Greater Toronto. Search MLS Listings, Find Homes For Sale and Sell Your Home. Greater Toronto Area REALTORS® reported 8,544 residential sales through the TorontoMLS system in July 2013. Total sales were up by 16 per cent compared to July 2012. Over the same period, new listings added to TorontoMLS and active listings at the end of the month were up, but by a substantially smaller rate of increase compared to sales. “Last month’s sales represented the best July result since 2009 and was the third best July result on record. Despite recent increases in average borrowing costs, home buyers are still finding affordable home ownership options in the GTA,” said Toronto Real Estate Board President Dianne Usher. “We are a year removed from the onset of stricter mortgage lending guidelines and many households who put their decision to purchase a home on hold have reactivated their search. An increasing number of these households are getting deals done,” continued Ms. Usher. Reflecting tighter market conditions, the average selling price for July sales was up on a year over-year basis by eight per cent to $513,246. The low-rise market segment continued to be the driver of overall price growth. It should be noted, however, that the average condominium apartment price was also up by more than the rate of inflation on an annual basis. The MLS® Home Price Index (HPI) was also up on a year-over-year basis for all major home types. “We are forecasting continued average price growth for the remainder of 2013 and through 2014 as well. Months of inventory for low-rise homes remains near record lows, suggesting that sellers’ market conditions will remain in place in the second half of 2013. An increase in listings in 2014 would lead to more balanced market conditions and a slower pace of price growth next year, albeit still above the rate of inflation,” said Jason Mercer, TREB’s Senior Manager of Market Analysis. Categories: The Kirby Report (Monthly) | Tags: Average selling price, Greater Toronto Area, gta home prices, GTA price chart, housing charts, Market analysis, Toronto real estate board, toronto real estate forecast, toronto real estate market watch, toronto real estate outlook | Permalink. The Greater Toronto REALTORS reported 7,765 transaction through the TorontoMLS system in March 2013, says the monthly findings from the Toronto Real Estate Board. The numbers are down 17 per cent compared to the numbers a year ago. The year-over-year dip last month sales were the same that started mid-way into last year. Key fact to note is the Good Friday holiday was in March instead of April 2012. Most of the time, we see fewer sales reported on holidays and weekends. The first quarter of 2013 saw sales amounted to 17,678. That’s down by 14 per cent compared to the first quarter of 2012. “Home ownership remains affordable for a household earning the average income in the Greater Toronto Area. There are many willing buyers in the marketplace today. While some households have put their decision to purchase on hold as a result of stricter lending guidelines or the additional Land Transfer Tax in the City of Toronto, other households simply haven’t been able to find the right house due to a shortage of listings in some market segments,” noted Toronto Real Estate Board President Ann Hannah. The average asking price in March was %590,879 was up by 3.8 per cent compared to last year this time. The average price in the first quarter this year was $308,066 – up by 3.2 per cent from the first quarter of 2012. “The average selling price and the MLS® Home Price Index Composite Benchmark was up on a year-over-year basis across most home types, especially in the low-rise market segments where supply remains an issue. TREB’s average price forecast for 2013 remains at $515,000, representing a 3.5 per cent annual rate of growth,” hinted Jason Mercer, TREB’s Senior Manager of Market Analysis. Categories: The Kirby Report (Monthly) | Tags: First Quarter, Real Estate news, the kirby report, Toronto Real Estate, treb | Permalink. Greater Toronto Area REALTORS® reported 5,793 sales in November 2012 – down by 16 per cent compared to November 2011. “Transactions have been down on a year-over-year basis since June, after being up substantially in the last half of 2011 and the first half of 2012. Some buyers pulled forward their decision to purchase, which has impacted sales levels in the second half of 2012,” said Toronto Real Estate Board (TREB) President Ann Hannah. “Stricter mortgage lending guidelines, including a reduced maximum amortization period and a purchase price ceiling of one-million dollars for government insured mortgages, have prompted some buyers to move to the sidelines. This situation has been exacerbated in the City of Toronto because the additional upfront Land Transfer Tax takes money away from buyers that otherwise could be used for a larger down payment,” continued Hannah. The average selling price was up by 1.6 per cent annually to $485,328. The MLS® Home Price Index (MLS® HPI) Composite Benchmark was up by 4.6 per cent compared to last year. “The moderate annual rate of price growth compared to previous months was largely due to a different mix in detached home sales this year compared to last, particularly in the City of Toronto. The share of detached homes that sold for over one-million dollars was down substantially, which influenced the overall average price,” said Jason Mercer, TREB’s Senior Manager of Market Analysis. “The MLS® HPI detached benchmark price, which tracks the price for a home with the same attributes over time, was up by almost six per cent in Toronto, suggesting that market conditions for low-rise homes remain quite tight despite a changing mix of sales,” added Mercer. Categories: The Kirby Report (Monthly) | Tags: city of toronto, how's the market doing?, keller williams aurora, keller williams newmarket, Keller Williams north York, keller williams toronto, kirby chan, north york condo, the kirby report, Toronto real estate board, toronto real estate charts, toronto real estate forecast, toronto real estate outlook, toronto real estate statistics | Permalink. September average selling prices were up compared to last year for all home types. An increase of more than 8.5 percent and the average selling price for last month’s transactions was $503,662. There’s a price growth in the City of Toronto, especially for condominium apartments with an eight per cent year-over-year growth. The Greater Toronto Area (GTA) REALTORS® reported that there were 5,879 transactions that went through the TorontoMLS system. Wondering what your home or condo unit is worth? Contact Me, Just Click Here or call me directly at (416) 305-8008. Categories: The Kirby Report (Monthly), Toronto Real Estate Industry | Tags: September 2012 Market Watch, The Kirby Report Toronto Market Watch, Toronto Real Estate Market Update | Permalink. Greater Toronto Area (GTA) REALTORS® reported almost 12.5 percent decline over the year compared to August 2011. 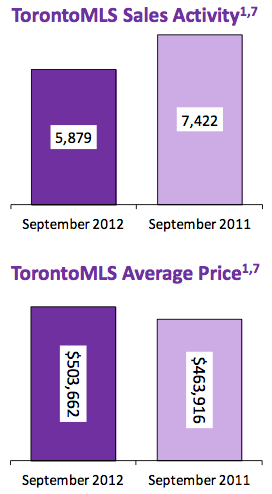 In August 2012, there were only 6,418 sales that went through the Toronto MLS compared to last year’s 7,330 sales. The number of new listings reported in August was down by 5.5 per cent compared to the same period in 2011. “Residential transactions were down in August compared to last year. Stricter mortgage lending guidelines, which came into effect in July, arguably played a role. In the City of Toronto, the additional impact of relatively higher home prices coupled with the upfront cost associated with the City’s Land Transfer Tax led to a stronger annual decline in sales compared to the rest of the GTA,” said Toronto Real Estate Board (TREB) President Ann Hannah. The average selling price for August 2012 transactions was $479,095 – up by almost 6.5 per cent compared to August 2011. The annual rate of price growth was driven by the low-rise home segment in the City of Toronto, including single-detached homes with an average annual price increase of 15 per cent. The MLS® Home Price Index (MLS® HPI)* composite index, which allows for an apples-to-apples comparison of benchmark home prices from one year to the next, was up by 6.3 per cent year-over-year. Categories: The Kirby Report (Monthly) | Tags: august 2012 real estate market watch, how's the toronto real estate market doing?, real estate market update, Toronto Market Watch, toronto real estate market | Permalink. Greater Toronto REALTORS® has reported a 1.5 per cent decline compared to July 2011. There were only 7,570 condo sales in July 2012, while there were 7,683 last year in the City of Toronto. “Very strong annual sales growth in the first half of 2012 and an earlier peak in sales this spring compared to 2011 help explain more moderate sales this summer. New mortgage lending guidelines and the additional upfront cost of the City of Toronto land transfer tax also prompted some households to put their buying decision on hold,” said Toronto Real Estate Board (TREB) President Ann Hannah. Even though sales have gone down, the average selling price in July was up four per cent to $476,947 year over year. The MLS® Home Price Index (MLS® HPI)* composite index was up 7.1 per cent year-over-year. “The GTA housing market became better-supplied in recent months. Buyers benefitted from more choice in the market place, resulting in less upward pressure on the average home price in July,” said Jason Mercer, TREB’s Senior Manager of Market Analysis. “The mix of homes sold in July 2012 versus July 2011 also appears to have changed, further influencing the average selling price. This is evidenced by the different annual rates of growth between the overall average price and the MLS HPI®,” continued Mercer. Categories: The Kirby Report (Monthly) | Permalink. Greater Toronto REALTORS® reported 10,350 transactions through the TorontoMLS system in April 2012. This level of sales was 18 per cent higher than the 8,778 firm deals reported in April 2011. The strongest sales growth was reported in the single-detached market segment, with transactions of this home type up by 22 per cent compared to a year ago. “Interest in single-detached homes has been very high, both in the City of Toronto and surrounding regions. Growth in single-detached listings has not kept up with demand, which means competition between buyers in this market segment increased. With this in mind, it was no surprise that the strongest annual price increase was also experienced in the single-detached segment,” said Toronto Real Estate Board President, Richard Silver. 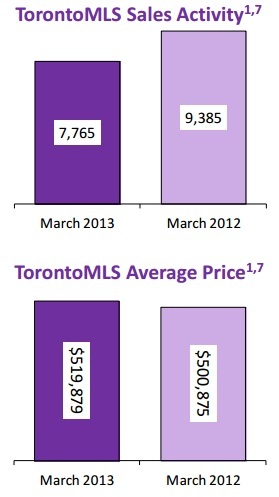 The average price for April 2012 transactions was $517,556 – up 8.5 per cent compared to April 2011. While price growth was strongest for single-detached homes, the better-supplied condominium apartment segment experienced a more moderate annual rate of price growth, at four per cent. “Monthly mortgage payments remain affordable for home buyers in the Greater Toronto Area. While interest rates are generally expected to increase over the next two years, the extent and timing of rate hikes has been thrown into question by slower than expected economic growth in the first quarter of this year. On net, borrowing costs are expected to remain a positive factor influencing home sales through 2012,” said Jason Mercer, TREB’s Senior Manager of Market Analysis. Categories: Real Estate Articles, The Kirby Report (Monthly) | Tags: average price of homes in Toronto, first time home buyers, gta home prices, how much is my home worth toronto?, is the toronto real estate market going down?, is the toronto real estate market going up?, looking to buy a home in toronto, Markham house prices, real estate outlook, Richmond Hill house prices, toronto housing forecast, toronto real estate statistics, treb market watch | Permalink. I am a Real Estate Sales Representative servicing the Greater Toronto Area. Less Than A Month Away! 6th Annual Thornhill Community Yard Sale!